Never before has U.S. head coach Dave Sarachan been in his current position as caretaker manager during a turbulent transition period. His contract with U.S. Soccer runs until the end of March. Sarachan, 63, grew up in Rochester, N.Y., and played several pro seasons in the old NASL and MISL before starting his coaching career in 1983 as an assistant at his alma mater, Cornell. He joined the Virginia staff assembled by Bruce Arena the following year, and following a decade as head coach at Cornell re-joined Arena at D.C. United in 1998. He was head coach of the Chicago Fire from 2002 to 2007, and since then has been an assistant to Arena with the LA Galaxy and U.S. national team. SOCCER AMERICA: Can you bring us up to speed on the Jonathan Gonzalez situation? First of all, why was he not called up for the November friendly with Portugal? 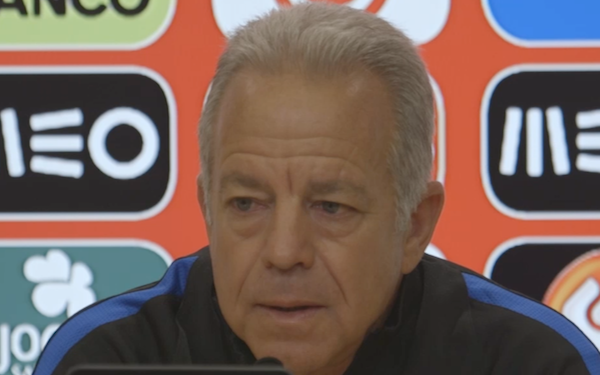 DAVE SARACHAN: That roster was built primarily with MLS players who were out of the playoffs and European players who were available because we were playing in Portugal and it was an easy trip. Simple as that. I do know our youth technical director Tab Ramos had been in consistent communication with Jonathan and obviously he played a lot with our youth national teams, so there was communication on that level. We never heard anything back from Monterrey [about releasing him for the Portugal game], the club was very quiet about all of this stuff. That was the reason. SA: And what about the January camp that starts Wednesday? The current camp we got no response. We asked Monterrey for permission to release him for the camp. We knew what the answer would be because they’re in their season but we went through the formal process of requesting permission. Never got one response back from Monterrey. I had one interaction with Jonathan through texting, but everything went very quiet over the last several weeks with all communication through U.S. Soccer. We knew something might have been up. We would love to have had him in January and he would have been part of the March games, which do fall in the FIFA window. This game with Bosnia does not fall in a FIFA window, so teams have the right not to release players. Dallas did that. But we never heard anything. At the end of the day, you have to respect the decision. Everybody will speculate on what everybody else could have done but maybe in his heart of hearts that’s what he chose and you can’t change someone’s heart. SA: Aside from the FC Dallas situation were any players excluded because of injury or other factors? Sebastian Lletget I would have brought in. He is cleared to play for the Galaxy and that’s great for him but it he’s been out so long it didn’t really make sense. I talked to him about it. It was in his best interest to get started with his club team after the long layoff. We missed him down the stretch [of the Hexagonal]. Him and Jordan Morris we missed badly. SA: As the first camp of the year, with most of the players coming off their break, there will be a lot of fitness work. Will you train twice a day most of the time? We’re not going to do a lot of that. I think we have two or three days when we have two sessions but you’re going to get what they’ll give you normally. January camps are a grind. They can be a grind for young players. They don’t know any better so like in a horse race we have to make sure we don’t get them out of the gate too fast and they don’t finish the race. We have to make sure we pace them. But they’ll come with the right mindset. That makes it exciting for them. SA: You have 30 players and just one game against Bosnia. A lot of guys are going to train and not play. Isn’t the lack of another game a huge drawback? It is a challenge. You’re right. But it is early in the whole process and there’s going to be hopefully other opportunities. For this particular group, we have 30 players and we can only dress 20, so that’s all part of it too. It’s up to them to make an impression. SA: The situation for this game is a lot different than the Portugal friendly but at least a few guys are back. How do you see this game as a continuation of the new cycle? This is a much younger group than we had for the Portugal game, and I’m expecting to see a lot of energy, a lot of enthusiasm. I thought we gave a good account of ourselves against Portugal and we could have won that game. This is a different setting with a long camp and another chance for them to play. It’s another step in the process. SA: The process is in place because of what happened during the Hexagonal, and particularly that final game in Couva. The players have said they felt confident. What was your mindset? You come into that game feeling as though you’ve got everything covered. We were coming off, arguably, a very good performance against Panama with an experienced group of guys. The days leading up to Trinidad were short, we had a few days to get our heads around it. All the boxes were checked: the tactics, the team selection. Everybody in that group had recovered and we felt were ready to go in that game. We felt that the information we gave to the group in terms of preparation and what they were about to encounter checked all the boxes. Of course, once again, you get reminded that there’s just no guarantees in sport, which translates into life. No one could have predicted that an own goal off the foot of Omar [Gonzalez] would somehow would get into the corner of our own goal 15 minutes in, and no one would predict a guy [Alvin Jones] would attempt a shot from that distance, let alone score it. All of those things happened in the space of the first half. So you’re sitting there, ‘Okay, what’s it going to require to get ourselves back into this?’ Well, getting the first goal early, which we did. Honestly, you ask me what I was thinking, at that point I honestly believed we were going to get the second goal. It didn’t happen and I guess the rest of history. If I was a betting man, I would have lost a bet that day. I felt all the boxes were checked to get a result and it just reminds you there’s no guarantees with anything. The optics didn’t look good. I can’t sit here and say we didn’t give a hard effort. Did we get our best performances out of a few key guys? No. It was a 90 minutes we didn’t expect but it happened. Then you had the other two teams [Honduras and Panama] getting the results they needed. It was a perfect storm. Hollywood couldn’t have drawn it up better. SA: Or worse, depending on your perspective. SA: What does finishing fifth in the Hexagonal say about the national team’s current place in Concacaf? These countries are getting better soccer people involved, better coaches involved. One of the current criticisms of Major League Soccer is that a lot of players outside of our country are getting opportunities through the mechanisms teams can get foreign players. If you look at the rosters of Panama, Honduras, Costa Rica and Trinidad, a number of these players are getting experience in our pro league. That’s fine, that’s part of the process but it helps develop them and the countries we have to compete with are improving as well. SA: Does MLS need to take some steps, perhaps reducing the number of foreign players, to give more opportunities for younger players, especially with teams sinking so much money into their academy programs? That is definitely a concern. It’s a big part of it. Coaches have to win, organizations have to win, for the all the reasons that are obvious. Now when teams sort of use that template to go for younger foreign players and pay that kind of money and get quality, it's sort of like of keeping-up-with-the-Jones mentality. Eventually that needs to be addressed. First of all, we’ve got to keep the younger American players, as many as we can. There’s still a number who bypass MLS and go overseas. So how can we keep them in our developmental systems, keep them in our pro teams and give them opportunities? Back in the NASL days, as you well know, when I played you had to have three Americans on the field. It was a crazy league and a crazy thing. I’m not advocating that today, but at some point, how are we going to address the fact we need to keep these kids and give them opportunities? SA: And what about broadening the reach of the federation into areas and communities that are under-served in many other ways including soccer? We’re a huge country and we’ve always said that. We have a large territory to cover and there’s a lot of youth soccer players in our country. It’s a massive undertaking to stay on top of it. We have a number of things in place where we’re trying to stay on top of it and at the end of the day we’re still going to miss kids. It’s just impossible to say we’ve got it all covered. Now that we have all these resources being put into the game we need to take advantage of that. We just had more than 150 kids down in one spot in Florida. There’s a lot of good coming from the system. At the end of the day, you still need good soccer people who are watching and identifying, and the coaching education is getting better. We all know the needs; now it’s a matter of implementing them and developing the good soccer people who can identify and coach good players. SA: The New Year started with that summit in Florida. Players at various age levels and their coaches gathered in one place. What are your impressions of that event? I think it was a good message to get everybody in one room – coaches and players – to give them an outline of what they are trying to achieve and telling them where they needed to go, all of that. I thought it was pretty successful. It was just another way of getting players educated about the process and to understand how to get to the summit, as they say. SA: What do you tell young players and their parents and coaches about going to a foreign team? Many have succeeded but many have failed. That is the point. Nothing is guaranteed, but the No. 1 reason you go anywhere is you believe that you will play. You have to play. If you’re enamored of a European city or team and you want that, but you don’t play, it’ll never hurt you because it’s an experience, but players have to play. My advice always is you need to go somewhere you will play or have the best opportunity to get on the field. Otherwise, it’s wasted. SA: A lot of academy players were at the summit, and many products of MLS programs are in the January camp. All MLS teams are required to field squads at several age levels. How do you evaluate that program? Before I came to the Galaxy, I was involved. That was in 2008 and it’s hard to believe it’s been 10 freakin’ years already. At the summit, I was talking with a lot of coaches who have been part of it through the years, it’s gotten trimmed a little bit and teams have added and all the rest. The sentiment is that for the most part, it’s been an important piece to development. Like anything that’s put into place, you can’t just sit back and admire it and say, ‘Boy, this is great.’ I think a lot of thought goes into making it better. Overall, I’d say it’s moving players along in the right direction. SA: What is your take on the high-school ban? I still believe a player should have an option to do that. In the complete developmental process, the social aspect is still an important part of it. They have to know what they’re doing, that the competition and everything won’t be nearly what it is, but if that’s what a player wants to do it doesn’t rub me the wrong way at all. If you’re on a lousy field and the competition’s no good, hopefully they can draw on their culture to use that experience to get better at something, instead of just walking through it and at the end getting nothing out of it. And that’s a challenge. It’s hard for a young player to be able to decipher that, but I still think if young players are exposed to what the next level is like and what it takes to get there you hope that message resonates to that individual. It’s up to the player to find something in that game to help move themselves along. SA: Were you one of those kids who wanted to play every minute of every day? Oh yeah. Nine in the morning until nine at night when I was a kid. I grew up on a street where there was a row of hedges and I’d dribble between them every day to challenge myself. That was me. We were out all day and in the summer came back at night. That was just part of the culture. SA: In those days nobody worried about kids like you burning out on soccer. How can coaches, parents, players, etc. manage the issue of player burnout? Burnout to me is a foreign concept, because to me if you’re a young kid who’s enjoying your training and enjoying the competition, in a culture and environment where you feel challenged but still enjoying it, burnout doesn’t exist. I think the concern is that, on balance, we have environments that are too structured, it’s forced, and players just aren’t enjoying it. We still need to develop coaches – hopefully taking former players through that process – who can work with players who understand how to enjoy their training and being pushed. The coaches need to know how to balance free play and some structure, as opposed to full structure with some free play. I think we’ve got that a little out of whack. 12 comments about "Dave Sarachan: On January camp, Jonathan Gonzalez, Couva and youth development". R2 Dad, January 9, 2018 at 10:19 p.m.
"I thought we gave a good account of ourselves against Portugal and we could have won that game." This is last century thinking. No one cares if you win or lose a friendly (N.I.C. Mexico). The point of the friendly is to get players some international playing time. It helped out McKennie. Ridge Mahoney replied, January 9, 2018 at 11:17 p.m.
read the first part of the first sentence. Bob Ashpole, January 10, 2018 at 1:53 a.m. I cannot help but fear that USSF politics has put the MNT program in limbo. Is there no sense of urgency about hiring a new coach? Sure it has only been a couple of months since we failed to qualify, but soon it will be 6 months past and then a year. Apparently USSF sees the past months as time to take a pause, rather than extra months to develop the player pool. Complacency will not bring positive changes. I would rather be reading about a new coaches plans for the 2022 cycle, no disrepect to Sarachan, but he is stuck in a caretaker role, treading water rather than moving in new directions. frank schoon replied, January 10, 2018 at 9:30 a.m.
Bob, Exactly, a caretaker role and that is one of the reasons there was no big push for Jonathan Gonzalez for Dave knows he has no future with the MNT, so why give the extra effort. I don't know anything about Gonzalez to make a judgment on wether he is good enough for the MNT but leaving that aside , reading the lame excuses in trying to contact Jonathan sounds more like a teenager trying to give excuses why he didn't clean his room, says enough. Wallace Wade, January 10, 2018 at 9:16 a.m.
“A massive undertaking”, “A large territory to cover”. This is a funny thing, reading this the day after the American Soccer public learns we have 1 full time Scout. Yea, I know, there’s a lot more that work part time and get paid a daily rate. I’d love to know how much the daily rate is? Ha! Even a bigger problem is that they are all just camped out at DA facilities, mainly MLS DA’s. You can’t make this stuff up folks. US Soccer development is asleep at the wheel, and have been for many years! Wish I could share some of the mind blowing stories along these lines that I know about. How many talented young players have we failed as the suits count the money? An outrage. Kent James, January 10, 2018 at 4:57 p.m. While I'm not sure how much delaying the hiring of a coach will hurt us (did it cost us Gonzalez? ), there are two reasons that it might make sense to delay. First, the election of the US Soccer president (if that is Gulati's role), so the newly elected president should not be saddled with a coach hired by the regime that's leaving. The other is that after the WC, there will be a few coaches (maybe some good ones) available that would not be able to leave before then. I appreciate hearing Sarachan's efforts to reach Gonzalez, since he sounds like a player we need. If the club won't release him (and they're not required to), not much we can do (though it would have made sense to push harder, to get a "no" rather than silence). Same with pursuing Gonzalez himself; if he doesn't get back to them (and Sarachan suggested he had already made his decision, and that was why he was not getting back), you can't make him play for the US. And one thing my son suggested to me was that perhaps given the current political climate inspired by Trump's anti-Mexico rhetoric, Gonzalez might not feel comfortable in the US. Bob Ashpole replied, January 10, 2018 at 5:21 p.m. I believe the concept that the USSF president should pick the MNT coach is exactly what is wrong with USSF. This reminds me of litigation. Every lawyer thinks he knows how to litigate even if he has never set foot in a courtroom. Business operations and sporting operations should be managed sperately. Delegation is a must in such a large organization. If the president and the board don't trust the directors or CEO, then they fire them and hire a replacement. Micromanagement is not the road to success. A key to effective leadership is figuring out what decisions should be made at what levels. I suspect that what USSF needs most is to establish better organization on the technical side. Kent James replied, January 10, 2018 at 11:44 p.m. I don't claim to know the best process of selecting a national team coach, but if the president is running the organization, and the USMNT is one of the key parts of the organization (and their success/failure will reflect on the president), it seems that the president should at least have some input on that decision. Isn't the much of the discussion about the presidency based on the success or failure of the national teams? The coaches may not be the only factor in the direction of the organization, but they certainly play a role. Assuming the president is elected to change something, they should be given the opportunity to make changes. Bob Ashpole replied, January 11, 2018 at 12:34 a.m. The president is a part-time volunteer who is like the chairman of the board, not a CEO. USSF has a CEO. beautiful game, January 10, 2018 at 9:59 p.m.
High time to get a total facelift with the National Team coaching staff. If Iceland & Belgium made positive moves, why can't we. beautiful game, January 11, 2018 at 10:59 a.m.
Samo-samo problems. Lack of communication and a stuck in gear coaching culture. Lonaka K, January 25, 2018 at 10:31 a.m.
Gonzalez, is but one player. If he choices to play for Mexico so be it. Look at how many German born players and othe European Countries have loss players to the US. So let.’s not cry over spilled milk and move on forward. Maybe because of Gonzalez not being in camp, Sarachan might find a pearl in the bunch.